A. Capsids associated with Importin alpha and Importin beta attach to the nuclear pore. B. The complex passes the nuclear pore and is arrested by interaction between Importin beta and Nucleoporin 153. 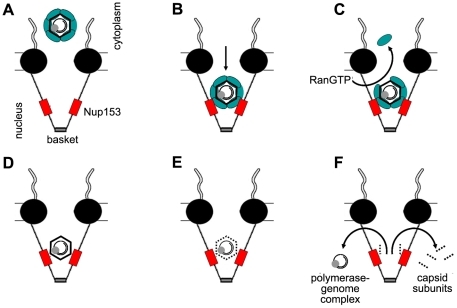 C. RanGTP dissociates the nuclear transport receptors from the capsid and recycles them into the cytoplasm. D. After removal of the nuclear transport receptors Nucleoporin 153 interacts directly with the capsid. Indeed the virion stays in the nuclear basket (Rabe et al. 2003 ). E. This binding would trigger capsid disassembly. F. Capsid subunits, which are supernumerary to the Nup153 copies, can remain bound to the viral genome or diffuse into the nucleus.